The Witchling Grows Up by Mary Moriarty is the first in a new series called The Family Pendragon. Justice is a 7000 year old vampire that used to be a fallen angel. Dylan is a ninety year old witch without her full powers. Dylan and her family of witches have long fought the Dark One. Now, he’s coming for Dylan, who could be the most powerful witch of her line. Justice saw her in a vision and knows she belongs to him, so he’ll do whatever it takes to keep her safe. This is a paranormal romance, with emphasis on the romance. Personally, I felt the plot was a little weak and the romance a little fast. The writing style is pretty good, and draws us into the story. Yet, we don’t really get a good feel for the characters’ inner emotions other than their lust for each other. In my opinion. 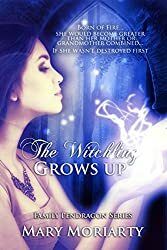 If you want to read it, you can find The Witchling Grows Up on Amazon or check out this and other books by author Mary Moriarty via her website.